Picasso is very good at grasping and exploiting any expressive possibility in any kind of earlier art. This is revealed with his own invention and Braque's, Cubism, initially posed a problem in this respect. In his paintings, faces are distorted as puzzle-like compositions and most of the features are lost. It took a while for Picasso to realize that Cubism could actually be deeply expressive: that the disconnection and rearrangement of parts of a person's appearance opened up vast new emotional possibilities for portraiture. You can see it from this Picasso painting, Bather With Beach Ball. 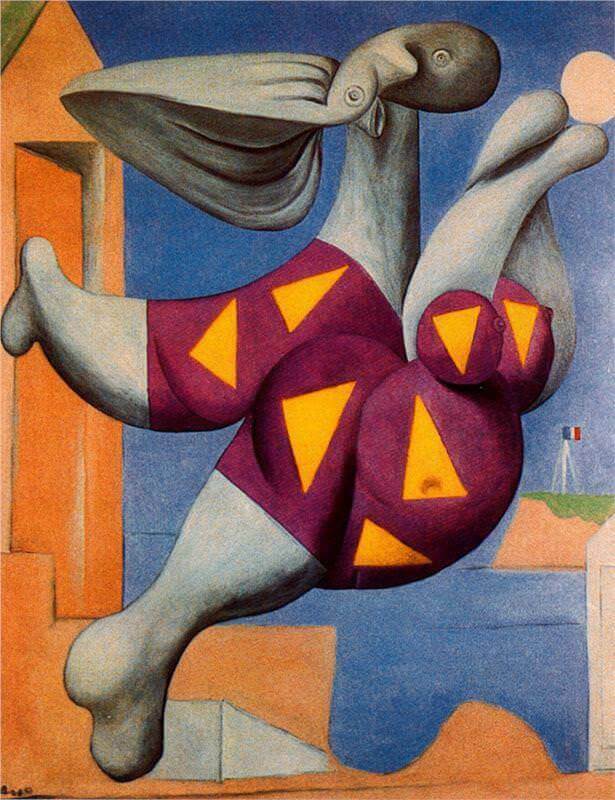 In this painting Picasso depicted his young mistress, Walter, as a pneumatic plaything, a floating zeppelin with a blow-up tube for her head. Although this is not the finest of Picasso's paintings of Walters, it was made special because of the tender effect: : a kind of low relief of soft forms fading into shadow that creates an evanescent image, a face seen in the half-light or as if through a scrim.